Have you ever wondered how you can download your DVDs to your Mac computer? With a lot of software, it’s difficult to do. Almost any piece of software will let you, but more often than not, there’s a loss on video quality as well as audio clarity. For most people, the option would then be to simply leave those DVDs on the shelf; however, in 2019 it’s never been more important to backup and digitize your DVD collection, protecting even some legacy DVDs against harm like scratches and simply losing them! Backup your DVD easily and for free as part of a limited time giveaway. Get your copy of MacX DVD Ripper Pro for free here. Every participant gets a chance to win iPad Pro, Netflix gift card and more prizes by sharing the campaign on Facebook. But remember to act fast, as the giveaway is only valid until February 20, 2019! So today, we’re going to show you how you can finally backup and download those old DVDs onto your Mac computer. Let’s dive right in, shall we? Copying over your DVDs to your Mac computer is so important. DVDs are easily scratched up, lost, and even destroyed by accident. That’s why copying your physical DVDs over to your Mac is something that is so important — digitize your collection of DVDs, and you’ll never lose that old school content ever again, and even new content! Besides, as the world moves towards preferring digital mediums to watch entertainment online, DVDs are slowly on their way out — it won’t be long before they’re altogether not sold in stores anymore. In fact, you might find that some of them are already unwatchable if you don’t have a DVD or Blu-Ray player at home anymore. Many laptops are even coming without CD trays these days! Digital is the way the world is headed, so by copying your DVD over to your Mac, you’ll be able to watch your favorite movies digitally at anytime you want, not worrying about whether or not you have the hardware to support it! There are some other benefits to copying your DVD over to your Mac computer as well. By copying the DVD over to your Mac, you’ll be able to easily stream it locally whenever you want. If you have a Chromecast or similar device, you could easily stream it over to your TV or Smart TV as well. You’ll never have to re-purchase a DVD again this way, since you’ll always have access to it in your personal files. This also makes it easier to share DVDs with friends. Passing around and keeping track of physical copies is a difficult task — and sometimes, DVDs will get lost this way. Don’t want a friend taking your physical copy and potentially losing it? Then you’ll definitely want to copy the DVD over to your Mac computer for easy sharing! As you can see, there are plenty of benefits to copying over a DVD to your Mac computer. So if you’re ready to copy a DVD, let’s get started. There are a couple tools that you’ll need to start the process of digitizing your DVDs to your Mac computer. The first and most important tool is some sort of way to read the DVD. If you have a Mac old enough that comes with a CD-ROM, you’re good to go. However, if you have one of the newer Mac computers, Apple has gotten rid of the player. If you still have a Mac that has a USB-A port, you can grab this DVD Reader. If you’re on a Mac that is exclusively using the new USB-C ports, you’ll want to grab this one instead. And probably the most annoying of them all — no audio, clips mixed up, or out of sync audio after the conversion. That’s why we’re going to use Mac DVD Ripper Pro. Well known for their DVD software, this is one of the few that maintains DVD video and audio quality. Generally, Mac DVD Ripper Pro would cost you some money — a whole $30 actually — but for a limited time only, you can grab your very own copy for free. The company is giving away well over 500 copies of the DVD Backup software for Mac, so you’ll want to grab yours while you can. As an added bonus, they’re throwing in an iPad Pro sweepstakes, so you’ll want to make sure that you don’t miss your chance to win! Enter for your chance to win here. If you miss out, you can still purchase a copy here. Finally, all you’ll need is a DVD that we can backup to your Mac computer! Why Mac DVD Ripper Pro? Mac DVD Ripper Pro is an excellent program for a lot of reasons. One of those is because of how feature full it is. It comes with a number of options to backup your DVDs. It’s one of the few programs out there that has wide support for DVD formats. You’ll be able to backup Japanese DVDs, homemade DVDs, any recently released DVD movie, 99-title DVDs, TV series DVDs, workout DVDs, and even damaged and unplayable DVDs. That said, there are a lot of options to digitize your DVD collection — even those DVDs that won’t play anymore. Load up DVD Ripper Pro, insert your DVD into the DVD tray, and you’ll be able to easily start the ripping process. It doesn’t take long either. You can backup a DVD in five minutes or less using the Level 3 Hardware Acceleration features. It extends your hardware to video decoding, processing, and then re-encoding, which makes DVD ripping five times faster than other programs. In theory, you could rip a 2-hour DVD at up to 320 frames per second in just five minutes. On top of that, the built-in High Quality Engine and Advanced Deinterlacing Accelerator keeps the output the same as the original quality. It’s hard to beat that! You don’t even have to save your DVD in a traditional format like .mp4. DVD Ripper Pro actually has over 180 different DVD formats that you can save your DVD as. This makes the file a little more versatile, allowing you to even transfer it over to an iPad or iPhone, and even many Android devices. There are 14 different audio formats that you can save the file in as well — perfect for listening on the go. Mac DVD Ripper Pro makes it really easy to move your DVD from its old, physical format into a modern, digital format of your choice. After downloading and setting up, open the program on your Mac. Before we get started, if you want the software to use the High Quality Engine — or if your Mac supports it — make sure to check the High Quality Engine box at the bottom right corner of the program, near the RUN button. Next, you’ll want to choose the destination folder where the full converted file should be. This will ensure that you can find the newly saved movie easily. However, if you don’t choose a folder, Mac DVD will choose one by default, usually in the same file hierarchy that Mac DVD Ripper Pro is located. However, you can always adjust it by pressing the Browse button at the center bottom of the program, and then selecting in your File Wizard where you want the DVD files to be saved. Next, we need to create the Output Profile — it’s actually not that hard, as Mac DVD Ripper Pro has many of these already setup for you. You just have to choose one! If you’re backing up to a Network Area Storage (NAS) or a USB and don’t care about the file size, then you may want to do a DVD Backup. This backs up the file size of the DVD without any compression, so you’re naturally going to get a large size. Select the DVD Backup option, and then select Main Title Content Copy or Full Title Copy, or you can select Backup Full Title to MKV — this will save your DVD in .mpg or .mkv format with 100% the original quality of the content. There are other file formats that you can choose as well. You might not want to clone the DVD image to your Mac computer, and instead transfer it over to another DVD directly. This time, click on the DVD Backup option in the Output Profile, and then select Clone DVD To ISO Image. You won’t lose any audio or video quality with an ISO file — the entire DVD structure remains unchanged this way. Or, you might want to transfer your DVD directly over to a digital copy that you can play on your Mac or another device. 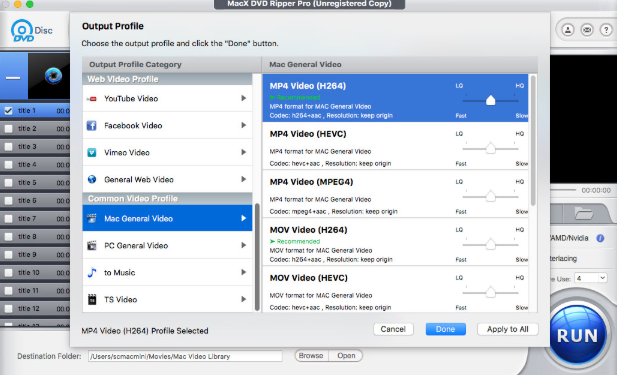 Open the Output Profile again, and instead of selecting the other three options, we’ll want to select DVD to MP4 or MOV. One of the nice things about this process is that it doesn’t take up nearly as much space as DVD to NAS because the process does involve data compression, but with High Quality Engine selected, it ensures that there’s no loss in quality whatsoever. For example, with High Quality Engine selected, an almost 5GB DVD is converted to a less than 1GB file without affecting the original quality of the movie. 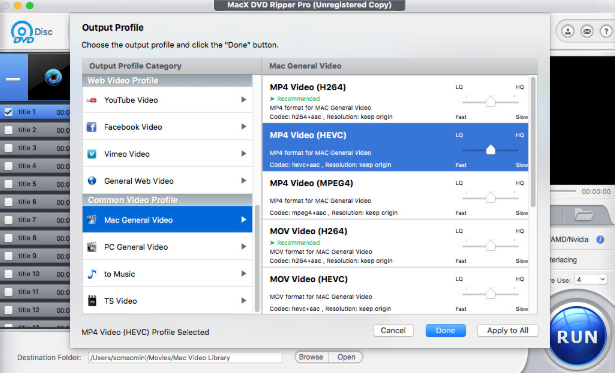 If you want the file even smaller, again — in the Output Profile — scroll all the way down to the Mac General Video section and select MP4 VIDEO (HEVC). This is the new video compression standard — it’s twice as small as H.264, but once again, you get the some original DVD quality. The nice thing about this is that — if you have a fairly large collection of DVDs, this new process allows you to save even more DVD files on your computer. You can adjust quality levels to reduce file sizes even more. You can actually do this through a slider on each individual file format as well. You can adjust it based on your needs, allowing you to move it for higher quality at a slower processing speed, or at a lower quality, but at a fast processing speed. As you can see, there’s a lot of different file formats and options to choose from to setup your DVD conversion, but once you’re finally through all of this, just press the big and bright blue button that says RUN at the bottom right of the program to start the ripping process. If you did it right, and depending on the length of your DVD, this conversion process can happen in just a couple of minutes, maybe even less! Once you’re done, you can find your converted file over in the Destination folder that we selected earlier in the process. From there, you can simply open up the file to watch it in your local streaming program. Or, if you want to share your file, you can do so in a digital format, or you can open up Mac DVD Ripper Pro back up, and then burn it to a new, blank DVD copy. From there, you can simply share that DVD copy with other folks, and it should play on DVD players and computers like a normal DVD! Of course, you don’t have to rip whole DVDs. Mac DVD Ripper Pro comes with some other handy, bonus features that you’ll want to take advantage of. For example, you can trim video clips right within DVD Ripper Pro, crop the frame size, add external subtitles, and even merge separate movie titles into one. This can help you reduce file sizes, but also help you trim up the parts that you want to leave out! Remember that you can get your own copy of Mac DVD Ripper Pro for free. They’re running a sweepstakes where anybody and everybody can snag themselves a license, putting DVD backing up and ripping in the hands of consumers. As an added bonus, they’re throwing in an iPad Pro sweepstakes, so you’ll want to make sure that you don’t miss your chance to win! Enter for your chance to win here.You can check out everything that Mac DVD Ripper Pro has to offer here. Ripping a DVD can, at first, seem like a difficult process, especially when there’s so much subpar software that’s out there against you. 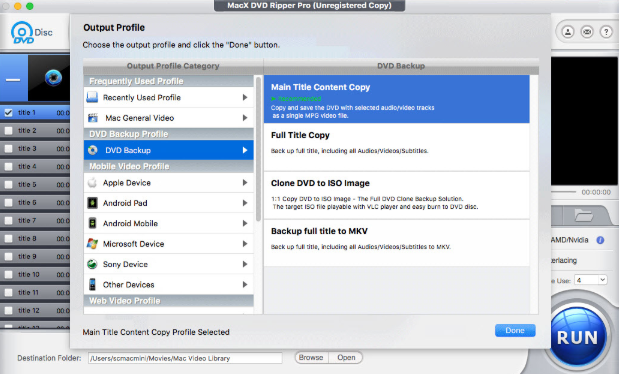 Luckily, with something like Mac DVD Ripper Pro, you can quickly and easily backup your DVDs to your computer. Depending on your quality settings and the length of the movie, you can have your own digitized copy in just a couple of minutes, if not less. The first time you run this, you’ll wonder where this program has been all your life! And, if you don’t want to participate in the sweepstakes, keep in mind that you can take advantage of the current holiday Buy One Get One (BOGO) offer that’s available. Buy a copy for yourself, and giveaway another as a gift. Got stuck anywhere? Be sure to leave a comment in the comments section below — we’d love to help you out so that you can finally digitize your old physical collection of DVDs! Editor’s Note: If you’d like to consider working with iKream.com, be sure to send us an email with your request. Backup your DVD easily and for free as part of a limited time giveaway. Get your copy of MacX DVD Ripper Pro for free here.Every participant gets a chance to win iPad Pro, Netflix gift card and more prizes by sharing the campaign on Facebook.But remember to act fast, as the giveaway is only valid until February 20, 2019!